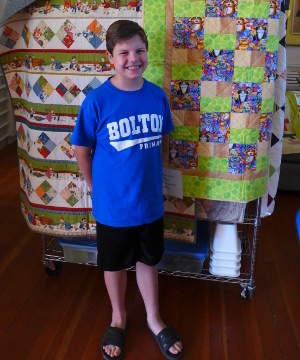 Eight year old Zack’s quilt (to his right in the picture) was one of 45 submitted for the annual Coffee Creek Quilters challenge on June 4th. Zack participated along with his grandmother, our own Judy Dunham. In past years all challenge quilts have been donated to Camp Erin, a summer camp for kids who have experienced bereavement. This year we also donated to Camp Sunrise, a project of Hospice of Redmond. Another change this year was to give quilts made by students in our prison quilting program along with instructor-made quilts. A total of fifty-six quilts were donated to the two camps. “Providing quilts to bereaved children has been a long term commitment for Coffee Creek Quilters instructors. The students voted that they would like to contribute also so this year is the first time student quilts have been donated to bereaved children. It is exciting to expand our outreach to Central Oregon especially since the students come from all over the state,” said CCQ President Linda Downey. Camp Erin is a national program where young people learn to grieve and heal following the death of a loved one. Funded by the Moyer Foundation and local groups, camps are held in 45 locations in the U.S. and Canada. The camp is free for kids aged 6 to 17. Oregon’s Camp Erin is administered by the Providence Foundation and takes place this year at Camp Kuratli in Boring, OR, August 12-14. Camp Sunrise is offered to kids ages 7-14 residing in Central Oregon who have experienced the loss of a loved one. Structured games, music, art, stories, and other therapies teach bereaved campers about grief and how to understand their feelings. The camp is open to up to 40 kids each year who reside in Deschutes, Jefferson and Crook counties and is offered at no charge. The three-day, two-night camp is held the third weekend of June.